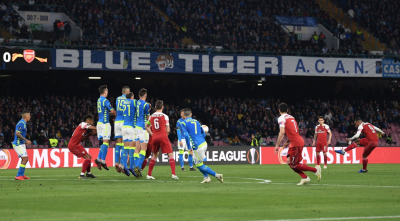 ROME - Napoli were knocked out of the Europa League quarter-finals by Arsenal on Thursday night, losing against the English side for a second time in a week following another limp performance. Carlo Ancelotti’s men went into the game off the back of a 2-0 first leg defeat. However, given Arsenal’s dismal recent form on the road, Ancelotti and his players knew they were still in with a shot of taking something from the tie. Ancelotti was not wrong to be assured. The home crowd did indeed turn up in force and drowned out the travelling Arsenal fans for much of the first half. Crucially, though, Ancelotti’s men failed to do likewise and, while they were not by any means outplayed, they showed very little of the defensive mettle or attacking prowess they have done over the course of the Serie A this season. A goalkeeping error by young shot stopper Alex Meret error allowed Arsenal forward Alexandre Lacazette to curl in a wonderful freekick from 30 yards out, an away goal that left Napoli needing four goals of their own to progress. They did come close through Jose Callejon and Arkadiusz Milik, but ultimately they were unable to break Arsenal's resistance, suffering only their second home defeat of the season and coming up well short over the course of the two legs. Defender Kalidou Koulibaly apologised to fans after the 1-0 defeat, and said his side needed to exhibit much more desire in their quest to progress. Arsenal now move on to play Valencia in the semi-finals, while Chelsea will meet Frankfurt on the other side of the draw. Napoli, meanwhile, will turn their attention back to ensuring second place in the league and hoping for better next year in Europe as their qualification for the Champions League seems all but guaranteed. 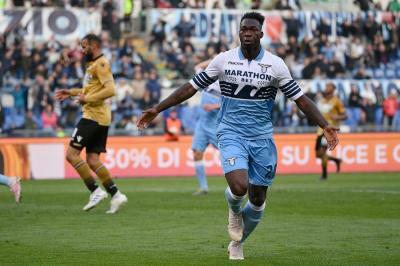 Lazio knew that victory against Udinese was essential if they were to keep their hopes of European football alive, and they were quick to take control of the game. Felipe Caicedo latched onto a Ciro Immobile through ball in the 21st minute, slotting in at the near post to put his side ahead, before a Sergej Milinkovic-Savic header was turned into his own net by Udinese midfielder Sandro a matter of minutes later. Udinese were gifted a glorious opportunity to get back into the game in the second half when Kevin Lasagna was brought down by Lulic inside the box. 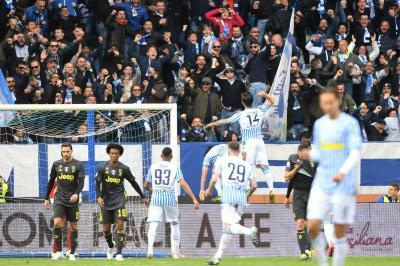 However, Lazio shot stopper Thomas Strakosha made a fine save from the resulting penalty, beating away Rodrigo De Paul’s effort and ensuring his side held onto their two goal advantage. The result moves Lazio to seventh, one point between Atalanta in sixth and only three off Milan in fourth. They host bottom side Chievo this weekend before travelling away to Sampdoria, knowing wins in both matches will be crucial as the Serie A moves towards its conclusion in May. The Old Lady’s odds of progressing got even better 28 minutes in when talisman Cristiano Ronaldo headed in from close range after he was left unmarked in the box for a Juventus corner. The hosts, however, could do little to stifle Ajax and found their advantage wiped out within six minutes. Donny van de Beek was played onside by some lackadaisical Juventus defending and had all the time in the world as he controlled a Hakim Ziyech shot and slotted an effort of his own past Wojciech Szczesny to draw his side level. Ajax continued to push forward, playing some exquisite passing football and dominating a side far more experienced than their own. 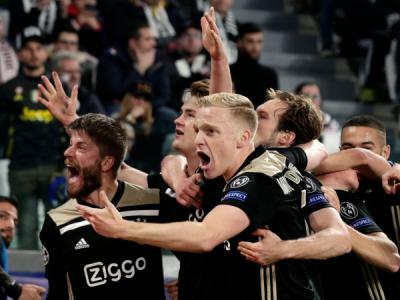 The Dutch outfit took the lead in the 67th minute through 19-year-old captain Matthijs de Ligt who showed experience beyond his years as he outmuscled two Juventus defenders to thunder home the winning header. This sparked delirium amongst the 2,000 travelling Ajax fans who then watched their side comfortably control the final twenty minutes. In fact, even though Juventus needed two goals of their own to progress, it was Ajax who looked the more threatening side in the closing stages. A string of fine saves from Szczesny and a close offside against Ziyech to rule out his wonderful effort were all that kept the score line at 2-1, in hindsight a poor reflection of the game. While Juventus will be disappointed with their efforts, especially given the hysteria surrounding this year’s Ronaldo-led campaign, Ajax’s performance was no fluke. They have now taken the scalps of both Real Madrid and Juventus, and while they will undoubtedly go into their semi-final match as underdogs yet again, it would be unwise to bet against their youthful exuberance. Ajax will now come up against either reigning English champions Manchester City or Tottenham. In the evening’s other match, Manchester United produced a sorry performance as they were outclassed from the off by Barcelona at the Nou Camp. Ole Gunnar Solskjær’s choice of defence had raised eyebrows before the match, and it wasn’t soon before their frailties were brutally exposed by Lionel Messi. The Argentinian whipped in two shots from outside the box in the first 20 minutes, before Philippe Coutinho came off the bench to bury the game in the 61st minute with a curling effort from 25 yards. Barcelona will face either Porto or Liverpool in the competition’s other semi-final. I nostri Azzurri ci raccontano i valori del gioco del rugby: valori che ritroviamo ogni giorno nelle iniziative di tutto il movimento. Potete saperne di più nella sua area di Federugby.it dedicata all'impegno sociale. 81 anni di amore per la maglia azzurra. Buon compleanno al Presidente Onorario della FIR Giancarlo Dondi!